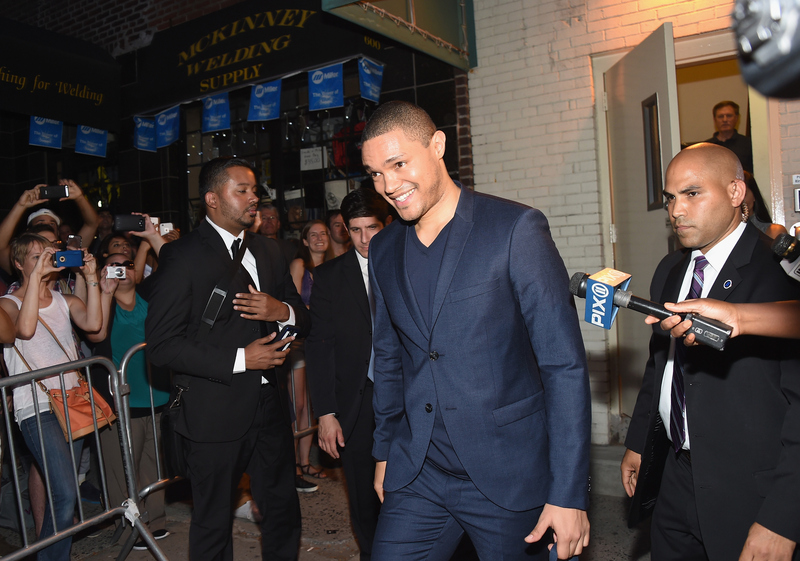 Trevor Noah has big shoes to fill, a phrase that, at this point, probably haunts him even in his deepest sleep. The 31-year-old comedian will make his debut on September 28 as the successor to Jon Stewart on The Daily Show With Trevor Noah, and, on Wednesday, Noah revealed his guests for his first week: comedian Kevin Hart, Bumble CEO Whitney Wolfe, and, for his first political interview, New Jersey tough guy governor and presidential candidate Chris Christie (and the glorious musical stylings of Ryan Adams). Noah's face-off with Christie is his chance to prove that he has the chops to carry on the craft of political satire on The Daily Show, but how will he do? It's too early to say, but he seems like he'll do just fine. In an interview with Rolling Stone on Tuesday, the new Daily Show host talked about his plans for making the show his own, and the insight he showed makes me feel more at ease about his taking over Stewart's seat. As the magazine reminds us, Noah first began his career in stand-up comedy in post-Apartheid Africa, making his debut in comedy "an inherently political act." He was frank, and wasn't afraid to be controversial: "Freedom is almost the first step, which a lot of people don't realize. A lot of people who aren't particularly progressive think that freedom is the end, but you don't realize that freedom is really the beginning of the conversation," he told the magazine. Basically, Noah doesn't have a history of being shy. And neither does Chris Christie. And, honestly, I kind of feel bad for Christie: he was the bad boy of the Grand Old Party before Trump came along. The New Jersey governor made an appearance on Jimmy Fallon trying to endear himself to America and distract from the fact that right now, he's only polling at 3 percent. Sigh. Is Christie hoping to continue his "remember me" campaign when he sits down with Noah next week? I hope that Noah seriously grills Christie about his policies, especially about his attitudes about women's healthcare when Planned Parenthood is at the center of a national debate. But what I really want to hear Noah go in on Christie about is the Black Lives Matter movement; disappointingly, there was not one question about the movement during the last Republican debate. Also looming over the interview is Noah's predecessor's long history of contention with Christie. Jon Stewart loved to mock Christie on his show, and he did it exceptionally well. Noah knows that, of course, and he's probably hoping that Stewart won't come up in their interview. It's his first political interview of what has already been a phenomenally insane presidential race, and, if he wants to compete with Colbert with the political jokes, he'd do well not to be soft on Christie.